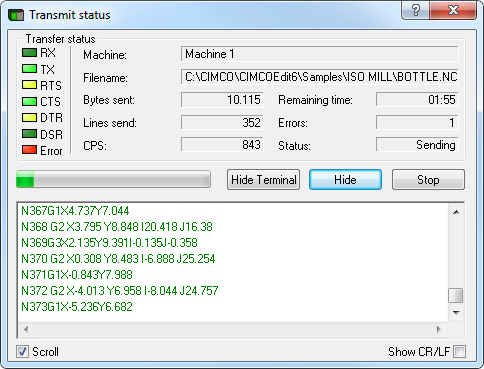 You can access the configuration of the selected machine through the icon . Read more about setting parameters for DNC communication under Configuración DNC. Seleccione en esta opción la máquina CNC para la transmisión de datos. Haga clic en el campo del tipo de máquina o en la flecha de la derecha para ver una lista desplegable con las máquinas disponibles para seleccionar. El tipo de máquina determina el puerto de comunicación y la configuración. Click this option to open the status window of current transmissions and/or receptions. The top left of the status window shows the signals of the serial data transmission according to EIA RS-232-C, which light up when activated. 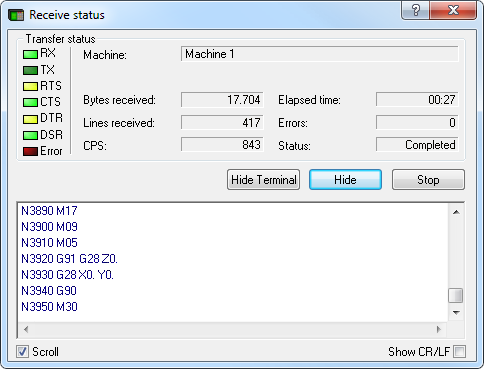 The top left part shows information of the current transmission (Machine, Filename, Bytes send, etc.). Below the transfer status information there is a progress bar, three buttons to Start/Stop and Cancel the transmision and Show/Hide the terminal box, which shows the NC program being transmited in plain text. Options to Scroll the text in the terminal box and to Show CR/LF (Carriage Return / Line Feed characters) are also available at the bottom of the window. Here you have the option to cancel the transfer (answering Yes) or continue (answering No). Click OK to confirm the receipt of this message.